Born at Winnipeg on 24 August 1921, son of James “Jim” Coulter (1881-1944) and Lily Jane Caskey (1884-1985) and brother of James Arthur Coulter, he joined the Winnipeg Fire Department at the age of 19 and volunteered for the Canadian Firefighters Expeditionary Force, where he served during the Second World War at Southhampton, England during the Battle of Britain and the Blitz. He returned to Winnipeg and worked as a firefighter for over 42 years, rising in rank to become Fire Chief of Winnipeg (1977-1981). He retired early on account of health concerns. 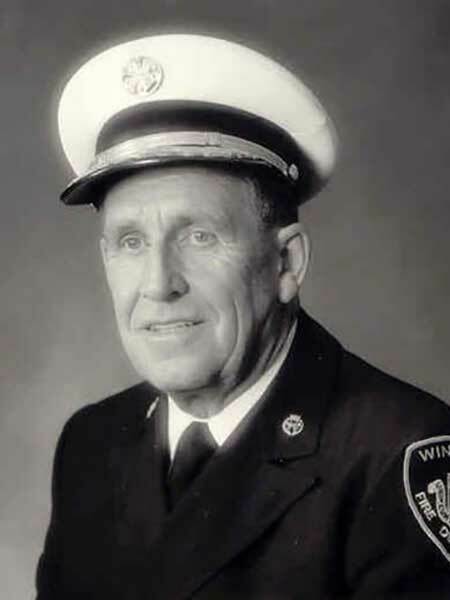 He was a founding member and President of the Fire Department Historical Society, and played a leading role in obtaining rights to the old fire hall for the The Fire Fighters Museum of Winnipeg, of which he was the Founding Director. He was a major contributor to the Vince Leah book Alarm of Fire: 100 years of Firefighting in Winnipeg, 1882-1982 (1982) and Halldor Kenneth Bjarnason’s We Hold Thee Safe (2004). On 15 June 1946, he married Mary Redmond at Winnipeg and they had four children. He was an active volunteer in the Riverview community and the Rosedale United Church. He died at Winnipeg on 6 April 2012. “Fire Chief sites health reasons for early retirement,” Winnipeg Free Press, 17 July 1980, page 5. Obituary [Lily Jane Coulter], Winnipeg Free Press, 2 May 1985, page 43. “Old Fire Hall to be museum,” by Vince Leah, Winnipeg Free Press Weekly North Edition, 4 February 1990, page 14. Obituary, Winnipeg Free Press, 14 April 2012, page B12. “A brilliant career,” Winnipeg Free Press, 3 May 2012, page A11.